I started out as a percussionist in school wind ensemble, marching band & big bands playing all sorts of music. I formed a few different rock and punk bands, eventually playing drums and writing a few songs for a jump-blues/swing band and did a lot of gigs around town. I entered college as a percussion major at the University of Nebraska-Lincoln, but switched to composition as a sophomore. By 2003, I'd become more interested in jazz and began to specialize a bit as a vibraphonist, and formed a quartet and began playing out a few nights a week. At the same time, I wanted to get into filmmaking and convinced a local videography company to give me a job so I could learn more about video production. By 2004, I was working for the university as an educational video producer in their New Media Center. 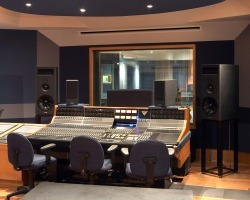 NYU Clive Davis recording facilityAfter graduating in 2005, I moved to New York City to study composition for film & multimedia with Ira Newborn at New York University. While at NYU, I formed a film-making group called the New York Film Collective that eventually grew to around 300 members and provided a forum for young professionals to connect and work together on independent film projects. I also worked for the music production house, The Lodge, as an assistant music supervisor, where I contributed to ad campaigns for McDonald's, Ford, Hershey's and many other major brands. After graduating from NYU with a Master of Arts in 2007, I left New York City, taking a job managing around 100 live performers working on four different cruise-ships for Barry Manilow's production company, Stiletto Entertainment, in 2008. I traveled around the world a few weeks a month eventually finding my way to Alaska, Hawaii, Mexico, Costa Rica, Italy, Spain, Portugal, England, Holland, Germany Denmark, Norway, Finland, Sweden, Estonia and even Russia. Then I settled down in LA and took a job as a music editor for the software company, SmartSound - makers of the Avid/FinalCut Pro plug-in, SonicFire Pro. I mixed, prepped and "blocked" hundreds of tracks to be used with that software. Meanwhile, other long-held interests - in economics, history and philosophy - bubbled up to the surface and I began producing videos and writing articles on those passions in addition to my entertainment work. 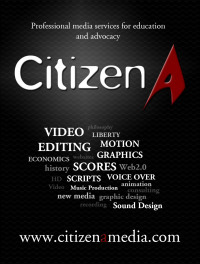 Eventually, I formed CitizenA Media to start working more exclusively on these kinds of passion projects, and to produce documentary & educational media. I won a few major projects with organizations like the Foundation for Economic Education and the Institute for Justice, and I was awarded a fellowship grant from the Moving Picture Institute, which really enabled me to start re-building my skills in video production. At the beginning of 2011, I was asked to come to Washington, DC to produced videos for the news website, The Daily Caller. In the 8 months I worked there, I produced around 125 separate projects which resulted in well over 250 videos which have appeared on the site and in major news media all over the web and on TV. I've filmed interviews with economists, professors, United States senators & congressmen, presidential candidates, authors, journalists, high profile businessmen and even a few entertainment celebrities. I've done man-on-the-street videos, straight news packages, opinion packages, comedic short films & spoof-videos, motion graphics-driven pieces, promotional videos and hour-long sitdown interviews. I even managed to write a few articles. It was both very rewarding and extremely exhausting. But now I have returned to producing educational & documentary media in support of Economic Freedom with the Charles Koch Institute.